Oh mah gawd, girl-freyends. Have you seen the rootin’ tootin’ Texan version of The Two Fat Ladies? 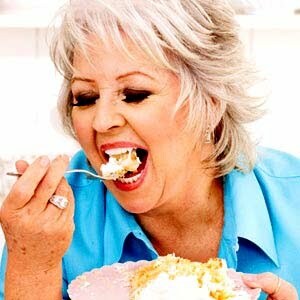 Paula Deen is actually just one fat laydee from the deep South, and she is possibly responsible for the obesity epidemic over the pond, y’all. She wraps cheesecake in pastry, deep fries it, tops it with cream and slathers it with sugar. She eats massive slices of lasagna sandwiched between two bodaciously buttered loaves of bread. She cackles in the face of the normal-sized portion. She's kinda cool – and also heartburn inducing. Hey kitchen goddess! I do love me some Paula – you have to look on YouTube for that show where her pants fell down and she flashed her pantyhose to the crowd!Just stopped by for a cuppa, and a favor…I've entered a contest to win a role on the retro-fabulous TV show "Mad Men" – but I need your votes to win!If you don't mind taking two seconds to vote for me, please go to my blog or use the link below, which takes you right to my photo page.http://madmencastingcall.amctv.com/browse/detail/EZ3MBHThanks so much! Hey there Mad Men Girl. I must check out the episode where Paula does that!!! Re: Mad Men, if you get the part on that wondrous show, you have to take me with you – I am obsessed with it! Have popped a vote your way – good luck…Lisa: perhaps Paula has stakeholder shares in Rennies? Anne – I think she has shares in Mt Sinai Hospital's cardio ward. Her cooking scares even ME, and I am no low fat queen.